Visit to Georgetown University: "Global Justice: Comparisons of the Rule of Law"
Colette Rausch and her USIP colleagues spoke about Speaking Their Peace during a half-day program titled "Global Justice: Comparisons of the Rule of Law" to a group of exchange students from across the Middle East & North Africa region at Georgetown University. 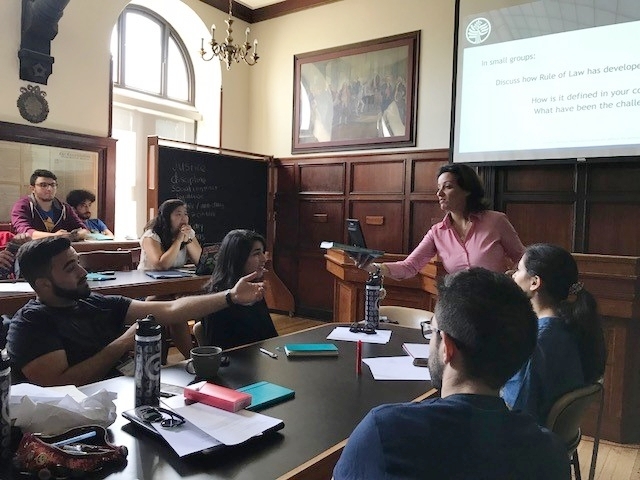 During engaging discussions about what it takes to craft a rule of law culture in different contexts, Colette highlighted Speaking Their Peace and the importance of understanding and incorporating individual- and community- level experiences. Two copies of the book were also given to students! Colette spoke to a group of visiting students from Melbourne Law School on her experiences in international law. She highlighted her work on Speaking Their Peace as an example of the importance of understanding the human dimension of working in conflict-affected societies. While many interviewed had suffered trauma and suffering, they also spoke of hope and resilience. During a visit to Washington State University on April 10th to speak in their Coffee and Politics Series - Colette highlighted Speaking Their Peace and signed copies with students. A post-event article was published in the the school's newspaper, The Daily Evergreen, and also referenced Salwa. In April, Colette visited her alma mater, Santa Clara University, to talk about the impact of serious crimes in conflict-affected societies. She highlighted Salwa's story to emphasize the importance of the individual peace builder and the use of the arts to transform conflict. Colette spoke to a group of students from the Peace and Justice Studies program at Utah Valley University, where she spoke about her work on fighting serious crimes, what citizens can do in their own communities to build peace, and also touched on stories from Speaking Their Peace! 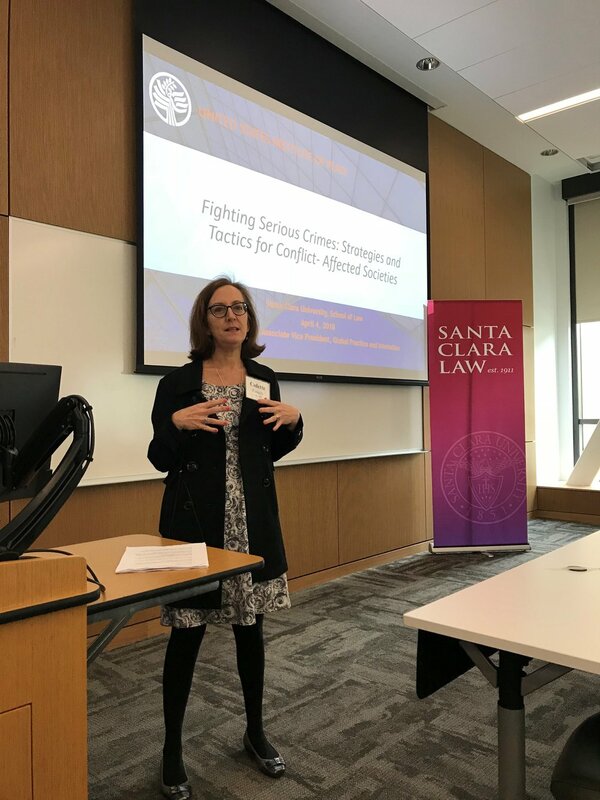 On Tuesday, February 20, 2018, Colette spoke at the Ambassador John Price & Marcia Price World Affairs Lecture Series on her recently published book, Fighting Serious Crimes: Strategies and Tactics for Conflict-Affected Societies. She highlighted stories from Speaking Their Peace during her presentation. On May 8th, Colette Rausch spoke to a group of undergraduate students from Union College, New York visiting USIP as part of their Semester in Washington program. She spoke about the dynamics driving insecurity, injustice, and ultimately violent conflict and touched on Speaking Their Peace as part of her presentation. A student from the class also received a copy of the book. On February 23, 2017, Colette Rausch presented on Speaking Their Peace at the International Studies Association's 58th Annual Convention. Books were available for purchase at the booth during the conference. On November 4th, 2016, Colette Rausch presented on Speaking Their Peace to 52 college students from the Washington Center during a visit to USIP headquarters. Students were juniors and seniors spending a semester in Washington D.C., interning at various local embassies, government agencies and think tanks. 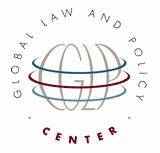 Colette Rausch spoke to 125 high school students from Georgetown University's International Law Summer Institute at USIP, welcomed by USIP's Public Education Center, and Speaking Their Peace and rule of law promotion around the world. She asked students about what rule of law meant to them and utilized the book as a cornerstone regarding the importance of rule of law in countries impacted by conflict. From Iraq to Burma, from Peru to Yemen, from Nicaragua to Nepal, the personal stories of widows, children, workers, soldiers often are lost in the cacophony of war. On August 7, Elliott Bay Book Company hosted a discussion of a new book that gives voice to those directly affected by violent conflict, Speaking Their Peace: Personal Stories from the Frontlines of War and Peace, by Colette Rausch. With a foreword by the Dalai Lama, the book collects interviews from 80 ordinary citizens -- a taxi driver, a nun, a machinery worker, a mother -- from conflict zones all over the world Their accounts illuminate the intensely personal experience of war, the uncertain transition to peace, and the aspirations that survive despite it all. Rausch, the associate vice president for Global Practice and Innovation at USIP, and Khitam Al-Khaghani, who lived and worked in conflict zones and was a part of the team that conducted interviews discussed their experiences in developing the book. A photo exhibit featured images taken during Rausch's travels and her meetings with interviewees. View the segment featuring Speaking Their Peace! Colette Rausch, author of Speaking Their Peace, chatted about her book on New Day Northwest on King 5 in Seattle. She talked with Margaret Larson about how she selected the essays, what inspired the project, as well as her work with the U.S. Institute of Peace. View video & photos from the event. Like many forms of art, photography provides an important means of capturing and sharing the stories of peacebuilders who are striving to end violent conflict in various settings. Ambassador Cynthia Schneider, a distinguished professor at Georgetown University who specializes in cultural diplomacy, especially in relations with the Muslim world, moderated a discussion with peacebuilders and photographers Leon Shahabian and Colette Rausch. They discussed the role of the individual in building peace, and the value of visuals in sharing those stories. Colette Rausch and Susan Hayward (both from the U.S. Institute of Peace) held a facilitated discussion grounded in Rausch's new collection of global voices, Speaking Their Peace. They explored how narratives, such as those from the book and others, reveal the shared hopes, challenges, and aspirations of seemingly disparate people from around the world. Public Education at USIP held a webinar where they spoke with author and associate vice president of USIP's Global Practice & Innovation, Colette Rausch, about her book, Speaking Their Peace: Personal Stories from the Frontlines of War and Peace. During the conversation, educators heard about war and peace from these incredible individuals, considered the value of collecting and telling stories, and explored how educators can use this book in their classrooms. Listeners were also introduced to the book’s High School Teaching Guide and additional educator resources from USIP's Public Education. Learn more about Public Education at USIP. Places as distant and different as Afghanistan and Peru, Sudan and Kosovo, have one thing in common: war. This collections of eighty interviews with people who have experienced armed conflict, whether as civilians, peacekeepers, parents, healers, or children, gives voice to extraordinary stories of survival and suffering, justice and trauma, from around the world. Colette Rausch, associate vice president at the United States Institute of Peace, has traveled extensively and listened closely. From Iraq to Burma, from Peru to Yemen, from Nicaragua to Nepal, the personal stories of widows, children, workers, soldiers often are lost in the cacophony of war. The U.S. Institute of Peace on Tuesday, April 28, 2015, hosted a discussion of a new book that gives voice to those directly affected by violent conflict, Speaking Their Peace: Personal Stories from the Frontlines of War and Peace, by USIP's Colette Rausch. View photos and video from the event. USIP's Viola Gienger moderated a discuss with Rausch, the associate vice president for Global Practice and Innovation at USIP, and Najla Elmangoush and Khitam Al-Khaghani, who have lived and worked in conflict zones and were a part of the team that conducted interviews. A photo exhibit featured images taken during Rausch's travels and her meetings with interviewees. Audience members had an opportunity to record their own 30-second messages of what peace means to them for a "Speak Your Peace" video. The event was followed by a reception and book-signing session.